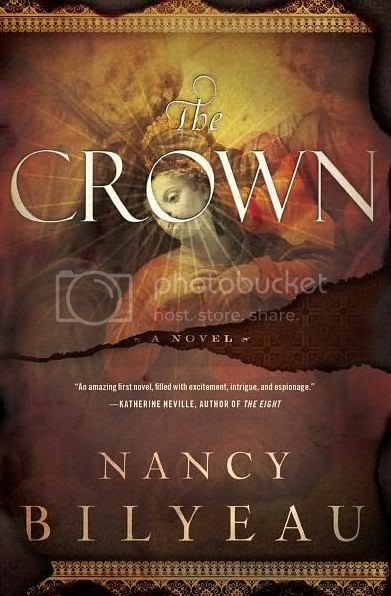 I am taking part in the virtual blog tour of Nancy Bilyeau's book The Crown. And I asked Anachronist to review the book. At the end of this review there is a giveaway of this book. An aristocratic young nun must find a legendary crown in order to save her father—and preserve the Catholic faith from Cromwell’s ruthless terror. The year is 1537. . .
First of all let me tell you that after finishing Wolf Hall by Hilary Mantel not so long ago I was really curious about this one as it concerned a similar period, only some years later – after the death of Jane Seymour, the queen number three. I wasn’t disappointed. My enjoyment was even enhanced by the fact that Ms Bilyeau presented the events as seen by the supporters of Catherine of Aragon and the Catholic Church, for whom Thomas Cromwell and his allies, closing the convents and confiscating their properties, were evil incarnated. It is always nice to hear the other side of the conflict. Joanna Stafford was certainly a great heroine – loyal in her friendship, consistent, intelligent and curious enough to break and tweak the rules of her convent while searching for the truth. Her mother was a lady –in – waiting of Catherine but Joanna, after one horrible day at the court, preferred to enter the convent instead. At the end of the book it is explained how horrible her first experience really was. I found it a nice touch, showing that any royal court was a nest of vipers, a very demanding and dangerous place especially for a young girl. I would compare it to working for a big international concern – a lot of stress, plenty of traps, murky, merciless rivalry, no guidelines whatsoever. Some secondary characters were a bit flat but I liked Edmund, the Dominican friar. His problems were interesting, I’m just sorry we weren’t shown more of him. The plot was filled with excitement, intrigue and espionage; small wonder the book, although not exactly short, was a quick, entertaining read, especially telling a story of a rather unknown medieval king, Athelstan, and his precious regalia. I fully enjoyed the fact that the novel was very well-researched, at least for such an amateur historian like me. I especially liked the description of Stonehenge and a strange pilgrimage of monks to that place. I also liked the convent life and the theme of messages hidden in tapestries. After finishing the reading I must say I felt a bit cheated. First of all, the tension started to ease too soon for me and at the end it kind of disappeared completely, even before I found the answer to all the mysteries. Mind you, the book is dubbed into a religious thriller. It was especially strange as it finishes with nothing less but a cliffhanger – we are not exactly sure what the future holds for Joanna and her fellow ex-nuns and ex- friars. Cliffhangers, contrary to the popular belief, don’t make me more curious; if anything, they make me twitchy and angry; in this case the ending was especially disappointing because I suspected something totally different, like a marriage of the main character with one of her suitors. Speaking about romance…I might be wrong but personally I didn’t feel the author handled it well. Let me explain. First we get a very strong and a very promising beginning, then the whole thing, along with the guy in question, is forgotten for most of the book, then the author resurrects it all a bit superficially just to allow it to fizzle into nothingness. It was mean – if there are plans for a sequel (what author doesn’t plan a sequel nowadays) Ms Bilyeau could have at least hinted at it. In short I would prefer the novel ending in a more conclusive manner and its romantic thread executed in a different style (but you know me – I am rarely pleased when it comes to that). Despite my romance problem and a rather equivocal ending it was a nice book, especially if you like the Tudors and 16th century in England. I enjoyed reading it and I would recommend it for fans of historical thrillers. 3. Just go ahead and tell me if you are entering. That's it. I definitely want to enter and read the book. I love historicals especially regarding Henry VIII. The Tudors series has peaked my interest in this time as well, and I can definitely see how Thomas Cromwell envenomed an entire populace with his conversion of the country. Great review! I have read it and agree with all of the points you made. I would have liked to learn more about Edmund as well. I'm always looking for a great historical fiction book to read. This time period does interest me and I may read this one at some point. This sounds like interesting historical fiction. It sounds like it had both its high points and its low points. I don't like cliffhangers either. Wonderful review. My sister really liked this one. No need to enter me - I'll read my sister's copy. But I live for heart pounding romances! Hmmm.. I don't know about this one for myself. I think I'd have issues with the disappearing tension and cliffy ending. But thanks for sharing your honest thoughts. I'm glad to know more about this one. Thanks for the review Ana, and I agree, I really dislike cliffhangers. the romance sounds disappointing for sure. No need to enter me, I already have the book and hope to read it soon. I am glad that you pointed out about the cliffhanger, I won't get my hopes up for a resolution. They make me angry as well. I have heard that there will be a sequel to the book so at least hopefully it will be concluded, but who knows. Thanks for the review. Thank you Ana for the review! Thanks for the review and giveaway. Yes please include me in the contest (layersofthought(at)gmail(dot)com. I have been eying this book for quite awhile now. Would love to win a copy! It's always interesting when Tudor novels select a relative unknown to be the main character. It didn't work so well for me with At the Mercy of the Queen and its narrator (Madge Shelton) but this one looks like its handled much better. Great review! Sounds like a good book. I love the Tudor period and well researched historical novels. Please enter me in the giveaway and thanks for the review! would love to read The Crown, so please enter me for the giveaway!! funny, I was just reading about this book last week on another blog. I'd love to win a copy, thank for the opportunity. No need to enter me, just stopping by to say that this does sound like a very interesting book and I too am always interested to learn more about the monarchy from this time period. Loved this review! I also hate cliffhangers but this book sounds interesting and I love the Tudor period, please enter me to the giveaway with my US address. Thank you. Thank you for the review, Ana. I love books set in the Tudor period. I definitely would love to be entered into the giveaway! Many Thanks! I enjoy historical fiction, and this sounds like a good read that will also teach me some things about this time. Cliffhangers do get me, but maybe since the book isn't so heavy on the romance part it wont be as bad.? Thanks for all your comments - I do appreciate and really read all of them but lately I've been pretty busy so sorry, I cannnot answer them one by one! It is always a pleasure to be your guest, Blodeuedd, my lady! If this book is going to have a sequel then at least the romantic thread might be a bit more palatable to me! I like more conclusive endings as well but I'm really looking forward to reading this. I think I'm up with it in the next few weeks. It looks like you learned a lot and I always like that with a historical. I have had this one on my TBR list for a while. Please enter me. I am a huge fan of the Tudor court and I am greatly interested in the viewpoint of Catherine of Aragon. She seems somehow to have been relegated to the background behind Anne Boleyn and Jane Seymour. Please enter me into the contest. I would love to learn more about the Tutor period. I would like to be entered to win this book. I really want to hear a different POV on the dissolution of the monsateries.. I'd love to read this, thanks for the giveaway! I would like to be entered to win this book. It sounds very interesting. Thanks for having this giveaway.